Once a month, my Department at work goes out to lunch. It’s a nice occasion for everyone to get out of the office together and share a meal. This past Friday, was our Lunch for June. We decided to go to Steak-n-Shake. Now, I could not even tell you the last time I ate at Steak-n-Shake. I know for a fact that I have only been inside of a Steak-n-Shake one time and have probably only ever had their food, twice. Upon arrival, we were seated in a location quite similar to a fast food joint but, with obviously, a lot more space. Rather than going the traditional route of a steakburger and shake (neither of which I like), I thought Outside of the Box. And I went with, a salad. After reviewing the menu, and nutritional facts, I went with the Southwest Chicken Salad. I requested this without dressing and without tortilla strips. I did ask for honey mustard dressing on the side. After our table got their shakes, and a bit more of a wait, our food arrived. The salad appeared to be a good size with a piece of chicken on the top. The first thing I found, was that this chicken was very thin. It was similar in thickness to the steakburgers, which is really not too much. Also, the chicken appeared to be room temperature. My guess is the chicken was done far before the rest of the tables food, and it simply sat waiting. First bite of the chicken, it did not really have too much flavor. There was no grilled taste or really any taste at all. Dipping it into the honey mustard helped but, it was still just pretty boring. As I began to eat the salad, I found all the different items that were contained within. In addition to the fresh lettuce, there were tomatoes, roasted corn & peppers, cheese, black beans and a few of those tortilla strips that I asked to be left out. The lettuce was excellent as were the tomatoes. I found the roasted corn & peppers to actually have a bit of a spicy kick to them. When I ate these on their own, it was a little too much for me but, with the salad, they both had a nice flavor. I found the black beans to be completely tasteless, much like the chicken. And the cheese, while it was visibilly there, did not add anything to the mix. I ate a good 95% of this salad without any dressing but, the few bites that I added dressing to, were quite pleasant. The honey mustard had a simple flavor to it but was very, very creamy. Overall, this salad was nothing special. Now, why would I expect for it to be when I am visiting a location known for their Steakburgers and Shakes? Well, I guess I wasn’t really expecting much. If I had to visit Steak-n-Shake again, I would not hesitate to order this. 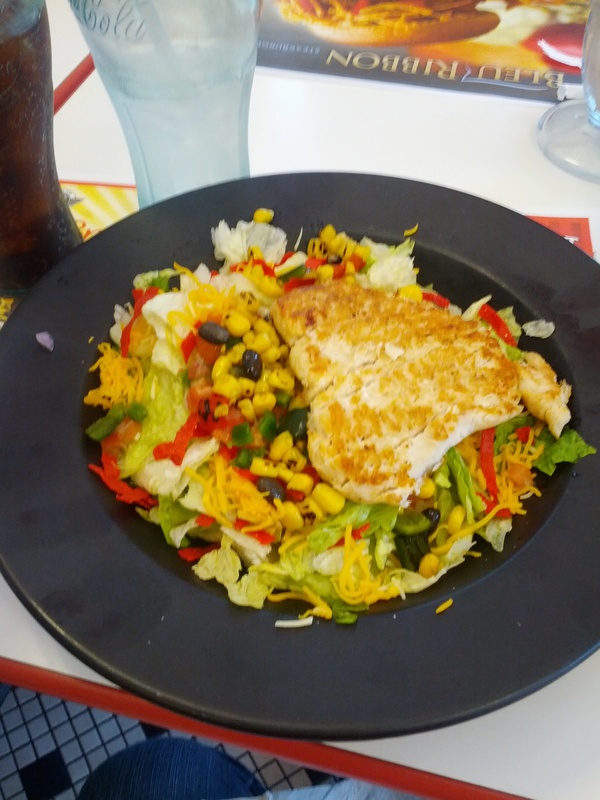 Yes, the chicken and black beans were flavorless but, the rest of the salad was decent. Plus, for under 500 calories (probably less as I left out the 2 dressings), this was a decent lunch. I will not be going out of my way, whatsoever, to visit Steak-n-Shake again. While the service was excellent, it’s simply not my thing. My thing – being Outside of the Box. In food & mind.